New Sandcastle – NOW WITH TUNNEL!!! Check this out, multiple towers, turrets, doorways, and even a tunnel that runs all the way from one side to the other without collapsing. 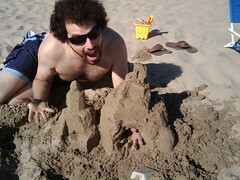 I feel like I’m making serious progress in the world of sandcastle building. To help out in the future, I bought a new book on sandcastle building from Powell’s online store, which should arrive in a few days and kick my sandcastle abuildingty up to a new level. In the meantime, though, pretty solid work, Joel. Keep it up. Seriously.